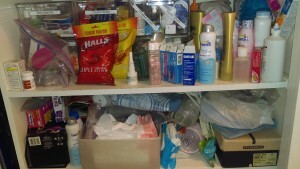 Last weekend, I cleaned “that shelf” in the hall closet. You know the one, we all have one: The overflowing shelf that is the catch-all for stuff that we need sometimes but not everyday. Cleaning it used to be a dreaded chore, until I finally decided that I could spend some money and get some supplies to make it easier to keep organized. 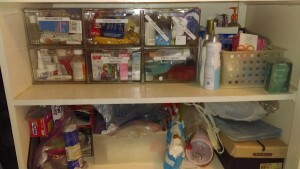 Several years ago, I went to The Container Store and bought a bunch of clear plastic drawers. These replaced the old shoeboxes and what-not that I’d been using to store all the random things we keep on that shelf. The drawers don’t actually keep the shelf organized. But they do make it easier to organize the shelf whenever the chaos gets too much for me. This latest round only took about 10 minutes to complete. As I stood there and shuffled cough drops and princess band aids back into the appropriate drawers, it occured to me that this situation is a good metaphor to keeping more important things, like my projects and my time use, organized. None of these things stay organized on their own. No matter how good my system is, there is still effort required to keep it running. Sometimes extra effort is required to completely overhaul the system because my needs have changed. 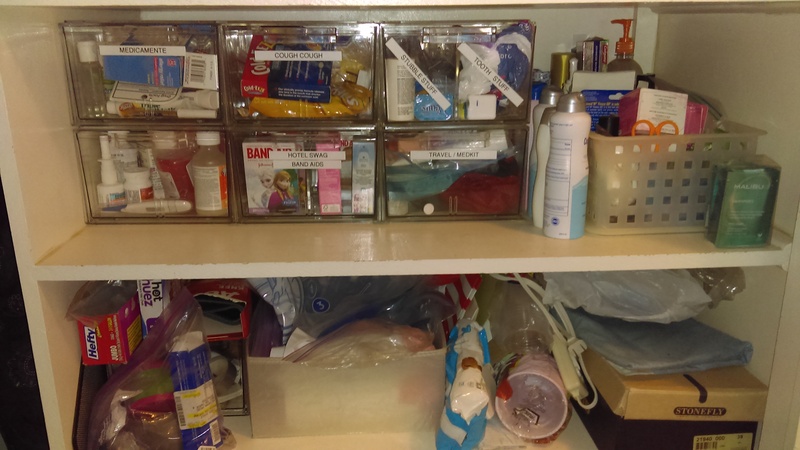 However, much like having those plastic drawers makes it easier to keep my hall closet organized, having a solid system- and the foundation of understanding other techniques I can add to my system as the need arises- makes it much, much easier to keep my projects and my time organized. The fact that making good use of my time takes, well, time was on my mind because I’d stumbled across an old Cal Newport post on the topic. He makes a plea for people to share the details of their approach to time management, so that others can see the effort involved. That sounds like fun, in a geeky, oversharing sort of way, so I decided to do it. With that caveat out of the way, here’s my current time management system. I am a list-lover, so my method is list heavy. At the base is my yearly goals list. I write this in December, based on my reflections about what I want to accomplish in the following year. Those are informed by my long term career goals and the shorter term constraints of my current employment. Since becoming an independent contractor/consultant/entrepreneur, those constraints come from my financial plan. Back when I was a regular employee, they came from my departmental or group goals. Writing the goals list is my long term strategizing time. My goals list is divided up by quarter, and is more detailed for the earlier quarters. I revisit it at least once a quarter and update as needed, based on changing circumstances and my own changing interests. For instance, right now I have a great new idea I want to pursue, which I already know is going to bump something in my current Q2 goals down to Q3 or later. One of my time use weaknesses is that I have a lot of interests, and therefore am prone to derailing myself to chase my latest shiny new idea. I keep this tendency in check by holding myself to a work in progress limit and by writing my ideas in a special notebook. I let myself explore the idea as much as I want in that notebook, but not start on it until there is space in my work in progress column. Sometimes, I’ll “park” an existing project (i.e., consciously decide to put it aside for awhile) to make room for my shiny new idea, but I try not to do that, because I need to make sure I finish things. My kanban board also helps me compare the shiny new idea against all the other ideas and tasks I have already identified. This helps me keep focused on accomplishing things that can actually lead to money, instead of just chasing each new idea as it comes up, but not finishing anything. But I’m getting ahead of myself. The next step after I write my yearly goals is to put specific tasks on my Trello boards. The tasks at this point are rather broad and sometimes amorphous. I might write something like “Q1 Seminar” on a card, knowing full well that to actually complete my “Q1 Seminar” (now known as Take Control of Your Time) I’ll need to do a bunch of more specific things, like settle on a topic, create content, and market the seminar. I have multiple Trello boards: one “master” board that reflects my current work, and then one board for each broad category of thing I work on. The master board has five columns: Prioritized, This Month, Parked (for things I started but then conscioulsy decided to put aside for awhile), In Progress, and Done. The category boards each have three columns: To Do, Prioritized, and Done. The To Do columns on the category boards are my deep backlog- a place to capture ideas and things I might do someday. As a task percolates up in priority, it moves to the category Prioritized column, then to the Master board Prioritized column, and then through the columns on the Master board. Once a month or so I look at my Trello boards and move things around. This is my short to medium term strategizing time. I ask myself two main questions as I move things around: What do I need to do to keep on track for my quarterly goals? What do I need to do to keep myself sane and happy? That second question is an important one to ask to guard against burn out. Forgetting to ask it is another of my time use weaknesses that I have to guard against. 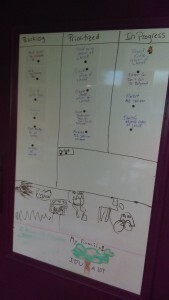 My physical kanban board, with art space for my kids at the bottom. Once something makes it to the In Progress list in Trello, it is ready for a little more specificity, and at this point, I like to get physical. I write specific things to do, like “Finalize Q1 Seminar content” on an actual index card and stick it on my physical kanban board. My physical kanban board has three lanes: Backlog, Prioritized, and In Progress. There is also a Parked area. Once something makes it to this board, chances are it is going to get done, but since I stick to my Work in Progress limit of 5, sometimes I decide to park something so I can do something else first. Before I got my new office set up enough to be able to start using the physical kanban board I had installed, I needed something else to fill in this “medium term” to do list space, and I started using a calendar to sketch out what I’d do over the next couple of months. I actually rather liked this system, but it is too soon to know if it will remain in use now that I have my kanban board up. The cards on the physical kanban board are a mix of specific things I can complete in a given day (like “Finalize Q1 seminar content”) and things that are still too big to be done in one day (like “Market Q1 seminar”). There is one more step in my time management process that bridges this gap. It is my daily to do list. I keep my paper to do list in a small spiral notebook on my desk. I write the day at the top of the page and then write specific tasks I want to do on the page. Often, I’ll realize there is a task I am not going to do today, but want to do the next day I’m working from home, so I’ll start that day’s page and write the task there. I almost always have at least a few items on the next day’s to do list before I quit working for the day. If I need to do work on the weekend, I write that list before the end of the day on Friday- and I do not add to it unless I realize I forgot something very important. If I am about to leave on a vacation, I write a list for when I return. This helps me clear the work items out of my head so that I can really relax on my vacation. I have one large client right now, where I spend enough time that they’ve given me a desk. My to do list for that client lives on a similar paper notebook on that desk. Things that need to transfer between the two daily to do lists do so on a sticky note stuck to my computer. I also have a calendar, of course, and use that to schedule appointments, and also recurring tasks like “write the Management Monthly newsletter.” I set the reminders to give myself sufficient warning for when I need to write something from my calendar on my daily to do list. The daily to do list is also where the other tasks of my life get integrated with my work tasks. My family has a calendar, and my husband and I share a “house projects and other chores” list, which is sometimes a shared Google Doc and sometimes just a piece of paper. As needed, I pull items from those to my to do list. Also, as I remember that I need to schedule a doctor’s appointment for one of my kids, or as I agree that I’ll arrange a play date or send documents to our mortgage broker or things like that, I write them on the appropriate day’s to do list. I’ve given up expecting myself to remember anything that isn’t on a to do list, a project plan, or a calendar. I think there is a limit to what I can hold in my head, and if I want to do big things without neglecting my family responsibilities and while remaining reliable in the smaller sense (i.e., if you schedule a meeting with me, I’ll show up), I need to clear space in my head, and the way I do that is to write things down. The writing of the daily to do list is where my short term strategizing happens. I try to make the list something I can complete, with perhaps one “stretch goal.” Although I start the list ahead of time, it isn’t “final” until I sit down with my morning tea and think about whether it is correct. Once I’ve called it “final,” I try to hold myself to completing the tasks, even if that means I need to log back on and do some work after the kids are in bed. Once it is complete, though, I don’t pull from future days. My work is done, and I get to relax! And that’s it. I called this “part I” because I think I’ll try to write a similar “nuts-and-bolts of how I keep things organized” post for projects soon. That will be a peak into my own particular project management method. Until then… feel free to share your own time management nuts and bolts in the comments! And if this is making you think you should consider leveling up your time management skills, check out the 1 hour time management seminar I’m offering. It is just $20, and if you sign up before 2/9 with the promo code “blog,” you’ll get $2 off. If you can’t attend live, don’t worry: you get a recording, and I welcome questions via email! Subscribe to my monthly newsletter to get a digest of all my posts here and elsewhere, plus other relevant links and announcements. You'll also get my "intro to time-tracking" document, which describes how to get started with time-tracking and how to get the most benefit from the exercise. All content copyright Melanie Nelson. Do not reproduce without permission.